BATTLE GROUND — Add Battle Ground to the list of Clark County school districts facing a strike. On Wednesday, 98 percent of teachers voted to approve a strike as of August 29. 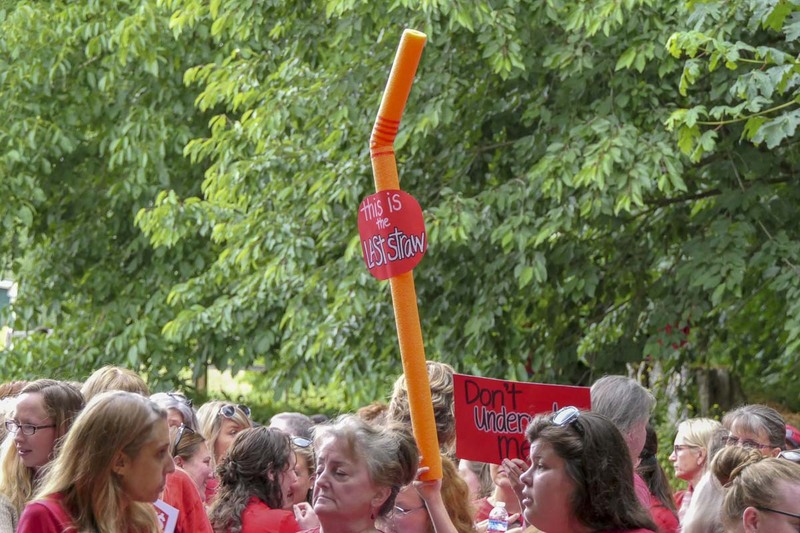 They’ll join teachers from Washougal, Hockinson, Ridgefield, and possibly Vancouver on the picket line next week, assuming a new salary deal isn’t reached. In Camas, where the first day of school would be Sept. 4, teachers are expected to vote on a possible strike next Monday. Educators in Evergreen are still under contract, but renegotiating their salary. The Evergreen School District is offering an increase of 8.4 percent, and says that would keep teachers at the county’s largest school district among the highest paid in southwest Washington. So far, the Evergreen Education Association has spurned the district’s offer, and teachers could vote Thursday to strike. At this point, the only area districts to reach a deal with teachers are La Center, and Woodland. According to the Vancouver School District, there has been progress in negotiations, with more meetings scheduled the rest of this week and Monday. In Battle Ground, Hockinson, Ridgefield, and Washougal, district officials have requested a state mediator to assist with ongoing negotiations. Since that will need to be scheduled, union officials are anticipating that school likely will not start on time. Is a teacher’s strike legal? A lot of people on our Facebook page have wondered if it is even legal for teachers to go on strike in Washington state. Technically, the answer is ‘’no,’’ with a BUT. There are actually three separate laws in Washington state making it illegal for a public employee to go on strike. However, according to the state Attorney General’s office, there are no statutes in the state providing any kind of penalty for a strike. Peterson readily admits that the debate over teacher salary funding is confused by how the legislature went about satisfying the state Supreme Court mandate. While they approved a massive influx of state funds to compensate teachers, they put a cap on local levy dollars that districts can receive. For most districts that is $1,500 per student, though a third of districts with ‘high property values’ can receive up to $2,500 per student. That was partly because property taxes went up statewide to pay for the additional education funding, and partly because local levies have been used to prop up teacher compensation, something the Washington Supreme Court determined violated the state’s constitutional obligation to fully fund basic education. For instance, in Battle Ground, Peterson says the district qualifies for 1.5 school nurses to cover 18 schools. That means the district has to use levy money to pay for additional school nurses. Battle Ground anticipates losing around 44 percent of its existing levy money due to the state’s new rules. Some of that was used for Time, Resource, and Incentive (TRI) pay that teachers receive for work outside of their contracted classroom hours, in addition to extra staff the state’s funding model doesn’t cover. The most recent proposal by Battle Ground school district included a 6.5 percent raise for teachers. The district says that would mean a new teacher would start out at $46,599, with the top end salary being $90,154 and the average wage being nearly $73,000 next year. Peterson says the district is rolling the existing 16 percent TRI compensation into the state’s old salary model, and then tacking on the additional amount. “They can’t say that the old SAM, and the TRI is their new base, because the state didn’t send TRI money,” she says. Instead, Peterson argues the district needs to negotiate the base wage without TRI pay, and then negotiate over that additional compensation. “We have gone down consistently, in six proposals, with our TRI. We have not gone down in our base,” says Peterson. Since the 1970s, local districts have increasingly turned to TRI pay, funded through local levies, to compensate teachers for time spent outside the classroom, and sometimes just as an added competitive ‘‘bonus.’’ Initially, TRI pay was earned throughout the year for non-contract work teachers performed. Over the years, that money was increasingly paid for what was termed ‘’deemed done’’ work, such as PTA meetings, lesson planning, additional certification work, and more — stuff most teachers would be doing anyway as part of their normal work. Much of the debate now is over what to do with TRI pay. Kelso schools and its union simply did away with it, rolling the money into the existing base pay. Battle Ground is attempting to do much the same. Other districts, such as Ridgefield and Evergreen, have proposed keeping some TRI pay, but doing away with ‘’deemed done,’’ and going back to making it compensation only for additional work. The rest would be rolled into base pay that teachers receive. The districts argue the move is necessary, so that remaining levy dollars can be used for what they were originally intended: extra educators or school staff above and beyond what the state pays for. For Peterson, as for other union leaders, the argument is one of priorities. If teachers give up money the state sent districts to pay them now, then they’ll lose that fight the next time around. She says districts received extra funding in other areas this year, beyond the $1 billion for teacher salary. Being a teacher, she uses the word picture of 100 teachers the district pays a dollar each, then asks them to give up part of their pay so they can hire more teachers to reduce class sizes. While the state did away with its salary schedule for teachers, it did set a base level of compensation for a starting teachers. In most cases, that’s around $43,000. The state superintendent’s office did not answer the question of whether a district could count TRI pay towards a teacher’s overall base compensation, leading to a lot of confusion and differing approaches to contract negotiations. The current negotiations have also opened up plenty of discussions about whether teachers are, in fact, underpaid. After all, even the state says teachers make more than the median income in Washington. Others argue that teachers are paid well, considering the number of days they work is less than the average private sector employee, and even most public employees. The Washington Policy Center says, if you calculate by hours worked, teachers in the Evergreen School District would average 66 dollars per hour. Peterson argues that’s apples and oranges. Wherever you land on the argument, it’s becoming increasingly clear that the legislature has some work to do next year when it comes to clarifying some of this stuff. A number of districts have sounded alarm bells that the raises teachers are demanding could leave them short of the money they need to finish the second phase of the McCleary mandated funding, which is reducing class sizes. They fear that a lack of clarity from the state could see the added funding swallowed up this Summer, leaving nothing to address the other major problems the state hoped to solve. While these issues get sorted out, it appears increasingly likely that thousands of Clark County parents will need to prepare for Summer vacation going a little longer than they had planned.